It was 4:15 p.m. yesterday afternoon. Snowflakes were drifting down and there was already a line of 50 people waiting outside the North Lansing Police Precinct gymnasium in the February cold for food. Some of them had already been there more than an hour and the distribution was not set to start for another 90 minutes or so. On this Friday night, we were not celebrating the bright lights of the gridiron, but instead trying to fulfill the basic needs of the less fortunate. I had the distinct honor of unloading and distributing food items from the Greater Lansing Food Bank (link to annual report) to some of our neediest fellow citizens through their Food Movers program. For four hours, nine of us from my Unitarian Universalist Church covenant group unloaded trucks, set up tables, distributed food, and helped carry the selected items to the customer’s cars. We were among 25+/- volunteers, of all ages, assisting with a number of tasks from registration, to sorting, to distribution. The experience was both uplifting and quite sobering. 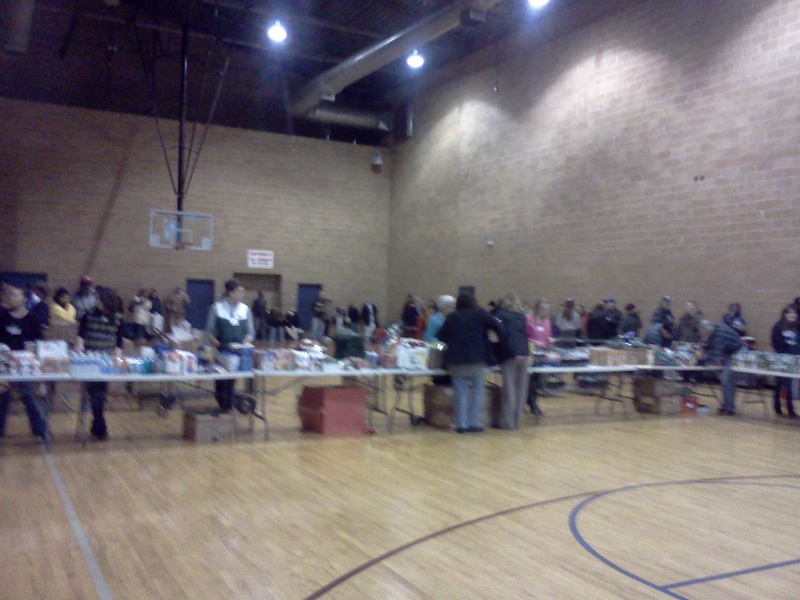 Last month, 73 recipients lined up for food on the third Friday evening of January amidst a snowstorm. Last night, more than 120 were lining the walls of the gymnasium to obtain their permitted allotment of food for the month. At least 120 kind, hardy, and proud souls, each with their own story of why they were there. Foodstuffs were plentiful, but it would not be enough to supply everyone equally. Sorely lacking, were fresh fruits and vegetables. Meanwhile there was enough bread to open a chain of bakeries and more sweets and soft drinks than a nutritionist would likely recommend. The first recipients whom I assisted were two neighbors who had arrived outside in line at 3:30 p.m. (distributions began at 6:00 pm). They were about fifth in line. A very sweet pair who enjoyed each other’s friendship and company. They were an absolute delight. The third person I assisted stood in line for over two hours only to be told at the registration station that she did not qualify for receiving food because she had not registered at least 24 hours in advance. Needless to say, she was unhappy but resigned to the fact that she would have to wait until the March distribution. If I were to have just one suggestion for improving this program, it would be to never, ever let someone leave empty-handed. Have individual bags of basic necessities held off to the side for such situations. Even though it was not my decision, I still felt heartsick, particularly since she had recently lost her home and had been living in a homeless shelter. The fourth person I assisted was a very kind and proud older man with a big Russian-style winter hat on his head. He reminded me of the quintessential Norman Rockwell image of a caring and loving grandfather. Quiet, reserved, and resolute, he carefully chose each item for placement in his bags and baskets. He too had a arrived with a neighbor – a young man with special needs. Next was an older woman and her daughter. As I carried her basket she daintily gathered up the specific items she wanted. While you had the choice of numerous breads, she only took as many as she needed, leaving the balance of her allowed allotment for others with large families, who might need it more. Lastly, I assisted a tall gentleman who had brought a plastic laundry basket to carry his food items. As he gathered up his goods, particularly canned vegetables and soups, the basket became so heavy that it took both of us to carry it out to his car in the parking lot. All the people I assisted throughout the evening were grateful for the food, were extremely pleasant and enjoyable to talk with, and were thankful for our assistance and for the bounty of food that had been donated. Those of us who weekly cruise in and out of out neighborhood grocery store with carts full of goodies would do well to be more thankful for and cognizant of our bountiful blessings too. I would highly recommend anyone with the time to consider volunteering to help distribute food for your local food bank. You will never take grocery shopping, and the bounty that is available to you, for granted ever again. A John Carroll University senior in Cleveland is using the city’s surplus of inexpensive housing and a $40,000 grant to house the homeless. Brian Mauk began the Metanoia Project (from a Greek term for a drastic change in one’s life) last year to rehab foreclosed and abandoned homes for the area’s homeless. Homeless people are recruited from the streets of Cleveland to take part in the project. Those who are matched with a home are expected to help out by working on other rehab projects.